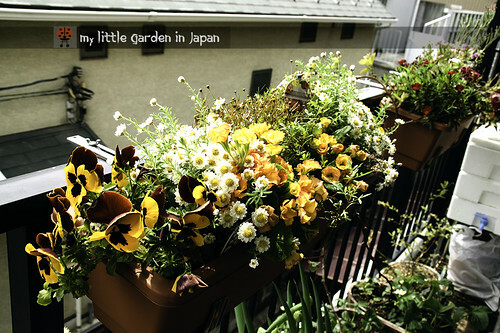 my little garden in japan: Long time no see.. It has been a while since my last post, and a lot of things in my life have changed, but one thing that remains is my love for gardening. So here is my attempt to revive this blog and try to get back to a set schedule. In all that absent time, I didn’t gave myself a chance to do much gardening, but my little garden in japan has survived well. There is a long story about how it is doing now, but I will let that for another post. For now I just want to thank deeply to everybody who sent me messages and mails wondering what had happen to my little garden in Japan. It is amazing to know you guys care, Thank you very much! I really don’t want to let this blog fade, I still have a lot of tips to share, projects to try and gardening to do. Time to get my hands dirty again. Welcome back FER. So glad to see that you are still into gardening. I always enjoyed your posts. I admire your ability to garden in containers in a small area, getting such great results. I also very much appreciated your generous comments on my blog. I rather assumed that as a student, your blogging took back seat to your studies. I am glad to see you back. Welcome back! The garden indeed looks like it is doing very well and I am excited to read more about it! Good to see you! I'd been wondering where you'd gone. Lovely to have you back again Fer. I'm so happy you're back to blogging. I'll look forward to hearing your stories and seeing your photos of your healthy garden. Hope all is well with you! Thrilled you are back! Hope you are well and looking forward to reading more about digging in the dirt! Good to see you back, I was a little worried. Glad to have you back! 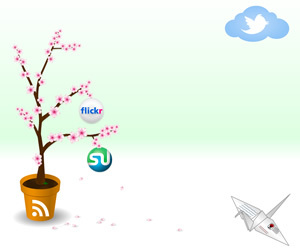 Visited your blog a couple of times, and thought of leaving a message - "Where are you? Is everything fine?" But then, decided to wait. Your little garden looks full of life! I will be visiting Tokyo next month - wondering if you know of any tropical plant nurseries / hobbyists into rare things like succulents, bromeliads, gesneriads, begonias and such. TIA. 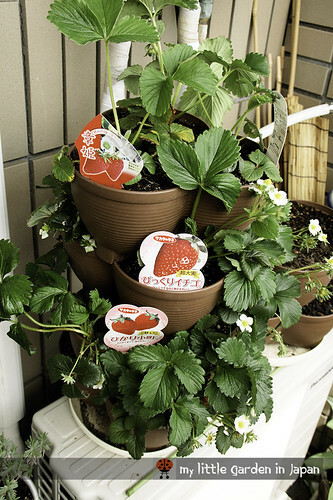 You can try sakata no tane gardening center. Is not exactly in tokyo, but i think is worth the half an hour trip. I just stumbled upon your blog. You have such pretty flowers in your garden. The pansies are lovely and your strawberries look great! Thank everybody! is great to be back and to see so many people welcoming me back. I will try to get back into gardening and blogging little by little, hope I can get a good grip on it again. I'm glad to see you've returned! 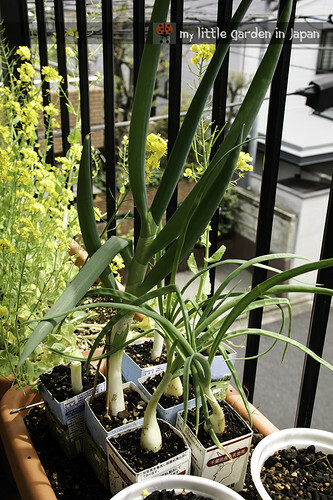 I just recently moved to Japan, and I want to get started gardening ASAP! I didn't think I could do much with a small space without a real yard, but your blog was an inspiration to me. Thanks, and I hope to read more of your stories in the future. So glad you are back!! :) those flowers are beautiful! It is really awesome post I like such beautiful flowers !! Thanks ! !